"Gather yee, gather yee for tales of generations past. Turn your clocks to late August 1991, a Summer vacation like many others spend in Algarve, a time with no cellphones and no Internet, a time where word of mouth and printed magazines where the de facto source of video game information, a time where there where no video previews anywhere! One faithful purchase changed Shiryu's entire life as a video gamer." In 1991, my young gamer life was gathered around the all conquering Commodore Amiga 500. Not only did I have arcade quality 16 bit tiles very reasonably priced, but the multimedia capabilities of the machine where something out of science fiction. It was even on this computer I began messing around with music production. In Portugal micro computers have always been popular all the way back to the original ZX Spectrum. Video game consoles where rare, expensive and not officially distributed until very recently, it was an entire new world of entertainment most kids my age couldn't afford or even fully comprehended: "Why would we buy an 8 bit console with very expensive games when we had 16 bit computers already at home?" seemed to be the running logic among my friends. Yet I was quite fascinated with the prospect of the Game Boy, in many ways the perfect portable gaming console, a "super" Game & Watch with interchangeable game carts. Thus even if somewhat expensive, I was intrigued to see an American video game magazine at local news stand. Most of the ones showing up in Portugal where either French or British. What was going on the other side of the Atlantic? I picked up GamePro issue #25 and... it changed everything! "What the hell is a Genesis?" I first wondered for a few seconds until turning to a double page ad for Sega's latest games. Americans called our Sega Megadrive the "Sega Genesis". It had recently arrived at our shores, but It failed to impress me just yet because the games I had played on it where nothing the Amiga couldn't do. What did impressed me and very much so was the coverage for "Phantasy Star III". Before this I had no conception of what a JRPG was, it seeded my ever lasting love for the genre. What other possible game could see you get married, have children, play with their children until they too got married and finally finishing the game with your grand children? Fantastic! Also recently on our shores were both the NES and the Game Boy. The magazine had extensive previews of upcoming games, some of them would take over an year until arriving in our stores, but it was an amazing glimpse to the future. Even the 8 bit NES left me with quite an impression with both previews of "Star Wars" and "Ninja Gaiden III". "Megaman: Dr Wily's Revenge" was reviewed on this issue. Again, I had to use my imagination on how this game would play, how it would move, what would the sound be like. But there where a lot more Game Boy games spread all over the magazine, namely "The Punisher", "WWF Superstars","Trax","Altered Space", my eventual to become personal favourite "Blades of Steel", "Roland's Curse" and "Navy Seals" spread across the back cover. No one around here had heard about any of them! 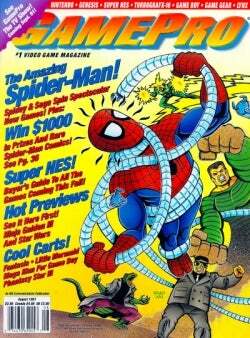 This issue of GamePro had extensive coverage on a new system about to be released in a few months in NorthAm: The Super Nintendo! I've heard very little besides the name about this new console, I was unfamiliar with it's tech specs, something that changed after reading all the information detailed in the magazine. It had more colours than the Amiga, eight audio channels and more importantly, a huge amount of Nintendo exclusives and support from both Capcom and Konami, company names that I was quite familiar with due to the many arcade ports featured on both Spectrum and Amiga. It was perceivable from the screenshots on the magazine the difference between both "Final Fight" and "UN Squadron" on SNES and my Amiga conversions of both games. They where more defined, more colourful, displayed more sprites on the screen... THIS was the home console for me! Of course the real stars of the show where the Nintendo offerings in the form of "Super Mario World", "Pilotwings" and most intriguing of all "F-Zero Race" (as it is named in the magazine). For me, racing video games where either top down or sprite scale. So using my imagination as best as I could, the entire Mode 7 "2D surface made 3D" futuristic hover car racing concept was immensely appealing. Thus, when every one of my friends was saving up to buy a Megadrive, I began saving up to get a SNES. No one understood why, no one listened to me when I said that Nintendo had something coming that was worth the wait. But in late 1992, it was all worth it. On that birthday, I got my Game Boy. A few months after that, "Megaman: Dr Wily's Revenge" became my very first Mega Man game (one I have already gave due tribute last year). In September 1992, I got my PAL Super Nintendo. My very first game? "F-Zero", up to today one of my favourite games of all time. Both these events would change my life as a gamer, shift my taste from micro computer to video game console, introduce me to many of Nintendo's franchises that still hold up today as my favourite gaming experiences. All because I randomly picked up a single video game magazine in a news stand while on Summer vacation. I believe this is nowadays hard to understand if you where born in an age of information, with videos and game information readily available on any networked computer or mobile device. But I must assure you, living in Portugal in those days with a full blow, aggressive Sega marketing campaign doing the rounds, I would almost certainly never had bought a Nintendo console. That kinda scares me, for even today I am very happy to have Nintendo in my life, their games have accompanied me since those young years into adulthood. So thank you GamePro, your impressive printed run ended back in 2011, but know that at least your work changed the gamer life of a boy in Portugal circa 1991. Thank you for your time reading yet another past memory of my gaming life. I look forward to hear about your magazine memories from last century in the comments below.